Bill Christie For the STAR Collaboration MARCH 24, 2015 1. 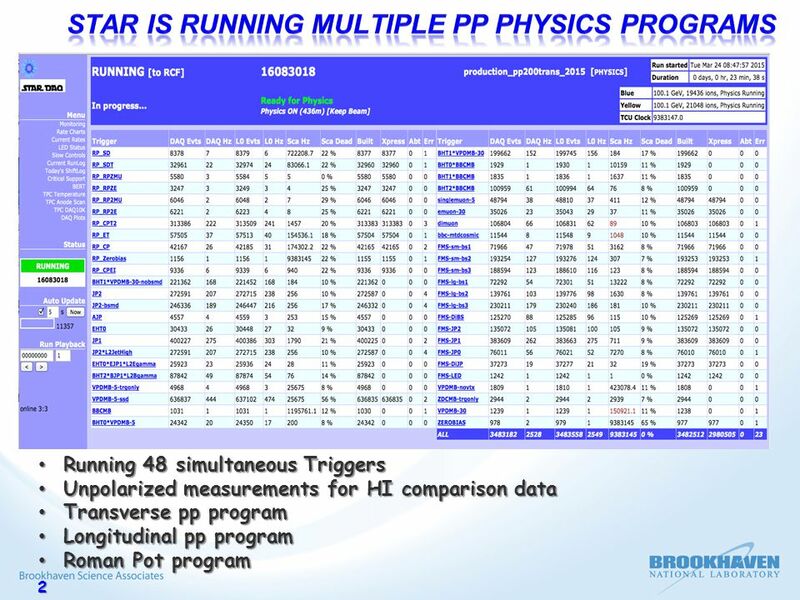 4 4 UNPOLARIZED PHYSICS PROGRAMS ARE PROGRESSING pretty WELL MTD PROGRAM HFT PROGRAM HFT & MTD PROGRAM Roman Pot program To reach our HFT data set goals, without an extension to the pp run, we’ll have to cut into our Transverse pp data set goals (JP1), as well as our Roman Pot goal. 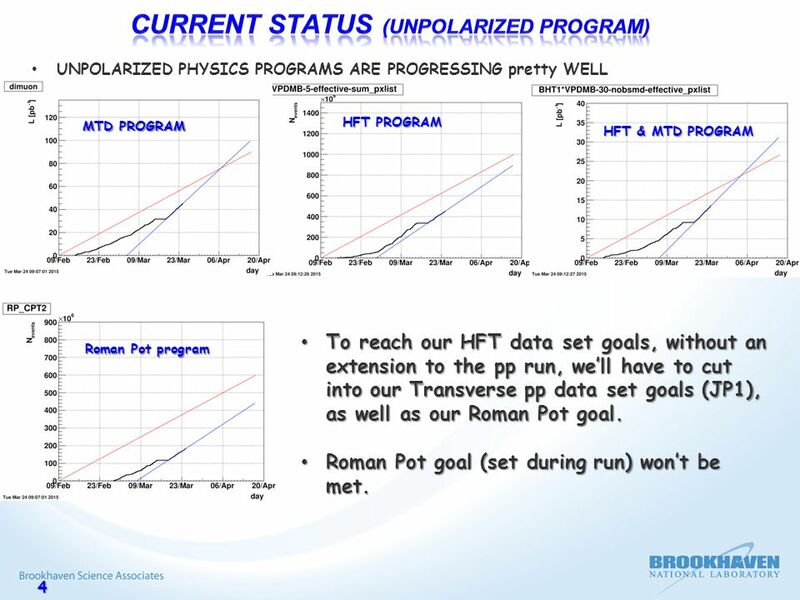 To reach our HFT data set goals, without an extension to the pp run, we’ll have to cut into our Transverse pp data set goals (JP1), as well as our Roman Pot goal. Roman Pot goal (set during run) won’t be met. Roman Pot goal (set during run) won’t be met. 6 6 Trigger Bandwidth constraint that we can take no more than 3 kevts per second Trigger Bandwidth constraint that we can take no more than 3 kevts per second TPC Bandwidth constraint that we can’t take more than 1800 Hz of events with the TPC TPC Bandwidth constraint that we can’t take more than 1800 Hz of events with the TPC We’ve tuned prescaled triggers to maintain both total event, and TPC rates close to limits. We’ve tuned prescaled triggers to maintain both total event, and TPC rates close to limits. 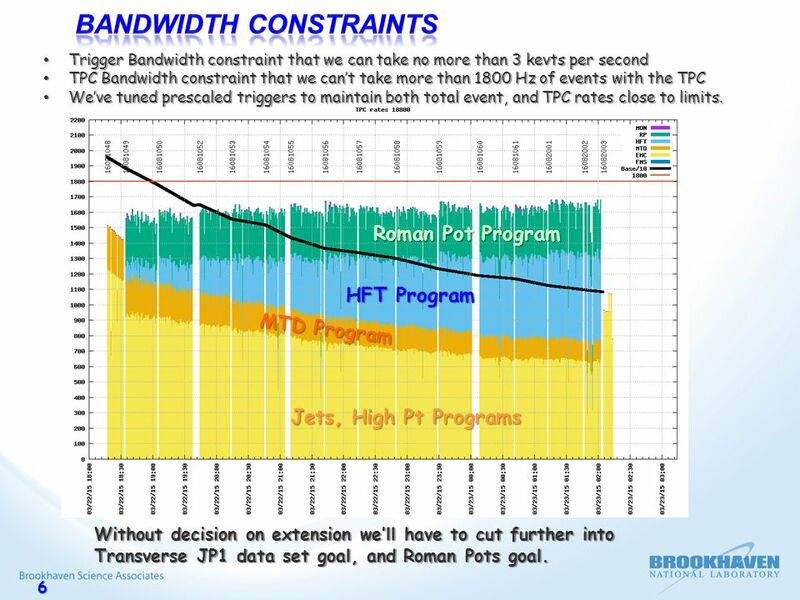 Roman Pot Program HFT Program MTD Program Jets, High Pt Programs Without decision on extension we’ll have to cut further into Transverse JP1 data set goal, and Roman Pots goal. 9 9 Both RHIC and STAR are running very well. 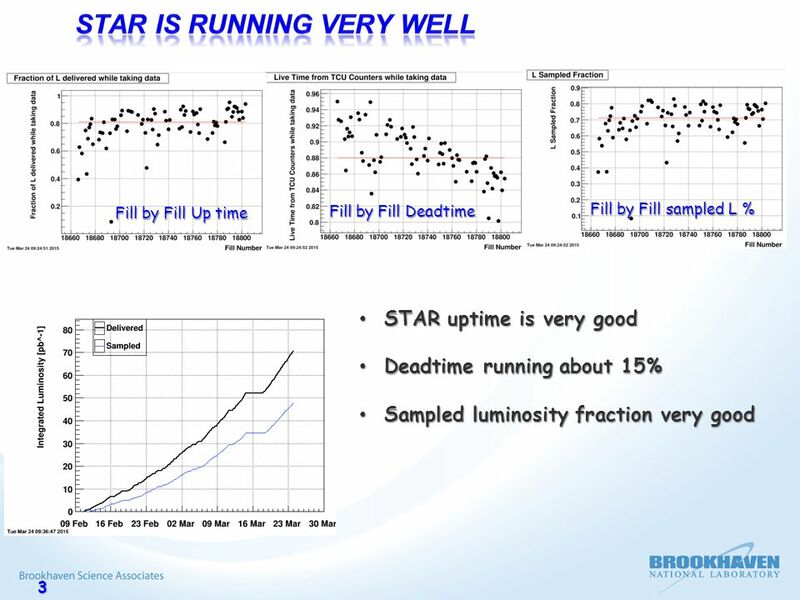 Both RHIC and STAR are running very well. 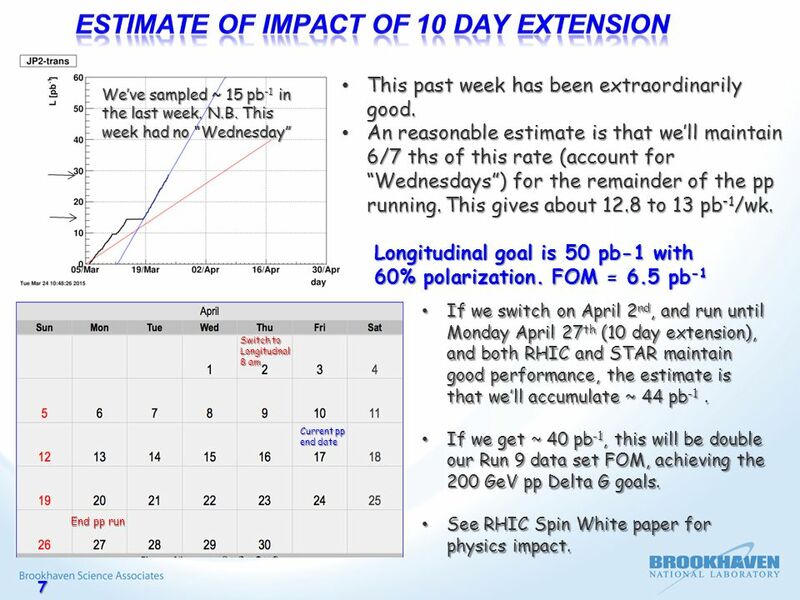 We estimate that, with a 10 day extension to the pp run, that we’ll meet all of our unpolarized pp data set goals, all of our Transverse data set goals (Jp1 on edge), and get 80+% of our longitudinal data set goals. 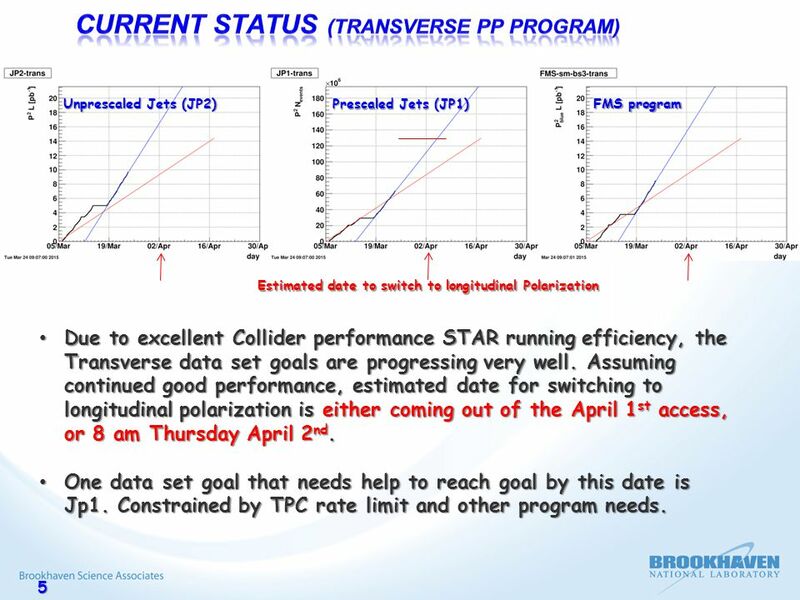 We estimate that, with a 10 day extension to the pp run, that we’ll meet all of our unpolarized pp data set goals, all of our Transverse data set goals (Jp1 on edge), and get 80+% of our longitudinal data set goals. If we reach 80+% of our longitudinal data set goals, this in combination with our earlier pp data will achieve the 200 GeV Delta G measurement goals as listed in the RHIC Spin White paper. If we reach 80+% of our longitudinal data set goals, this in combination with our earlier pp data will achieve the 200 GeV Delta G measurement goals as listed in the RHIC Spin White paper. If we don’t get this extension, we’ll have to sacrifice part of our transverse spin goals, and our roman pot goals, to achieve our HFT goals. We’d achieve ~50% of our longitudinal spin goals. If we don’t get this extension, we’ll have to sacrifice part of our transverse spin goals, and our roman pot goals, to achieve our HFT goals. We’d achieve ~50% of our longitudinal spin goals. As far as the impact of the extension on the p-A program, STAR’s position is that we have to accumulate a good p-Au data set before any consideration of a second p-A species. As far as the impact of the extension on the p-A program, STAR’s position is that we have to accumulate a good p-Au data set before any consideration of a second p-A species. If we can’t make this decision today, in an effort to reach our HFT goals, we request that the store lengths be increased immediately by 1 hour. If we can’t make this decision today, in an effort to reach our HFT goals, we request that the store lengths be increased immediately by 1 hour. 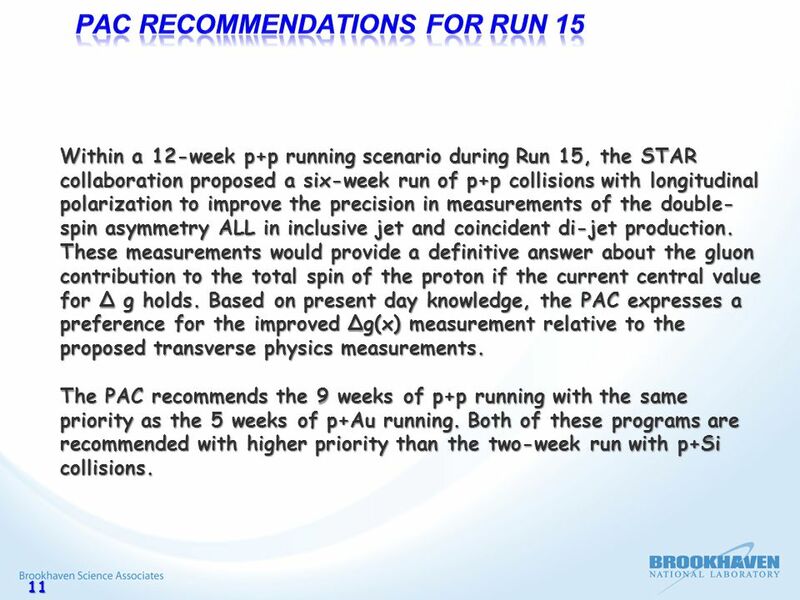 11 11 Within a 12-week p+p running scenario during Run 15, the STAR collaboration proposed a six-week run of p+p collisions with longitudinal polarization to improve the precision in measurements of the double- spin asymmetry ALL in inclusive jet and coincident di-jet production. These measurements would provide a definitive answer about the gluon contribution to the total spin of the proton if the current central value for Δ g holds. Based on present day knowledge, the PAC expresses a preference for the improved Δg(x) measurement relative to the proposed transverse physics measurements. 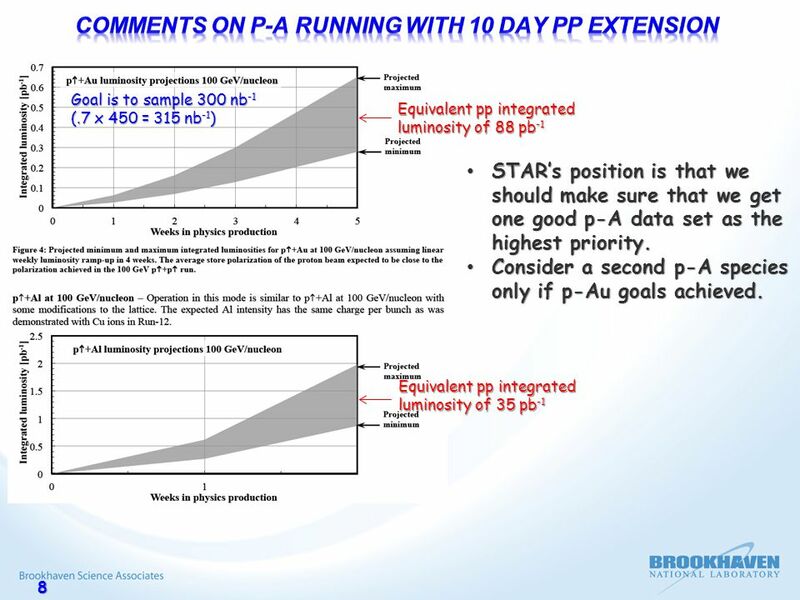 The PAC recommends the 9 weeks of p+p running with the same priority as the 5 weeks of p+Au running. Both of these programs are recommended with higher priority than the two-week run with p+Si collisions. 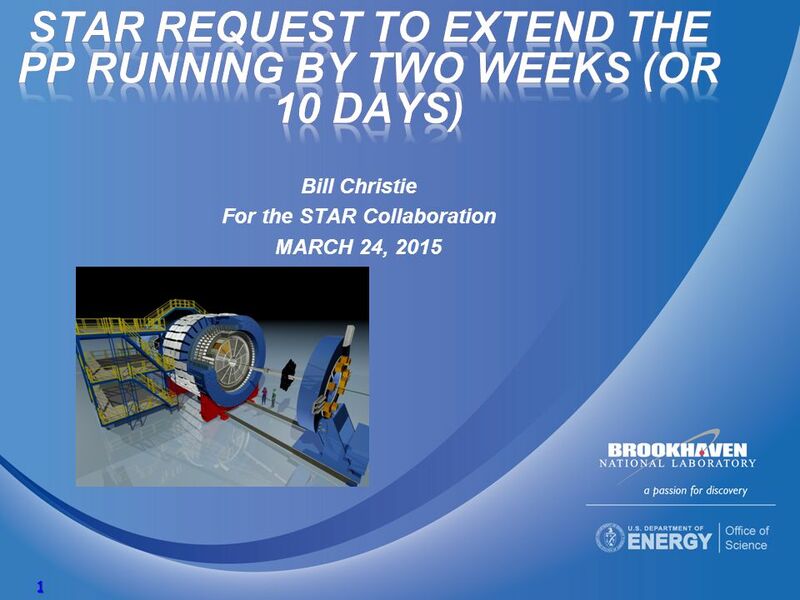 Download ppt "Bill Christie For the STAR Collaboration MARCH 24, 2015 1." Trigger Outline for Au-Au Option in Run-4 Planning for TN (Trigger Nirvana) in Run Expectations for Run-04 Au-Au Luminosities 2.Trigger Planning. Brookhaven Science Associates U.S. Department of Energy Todd Satogata 1 Fri May RHIC FY03 Deuteron-Gold Performance n RHIC Deuteron-Gold Performance. STAR W.B. 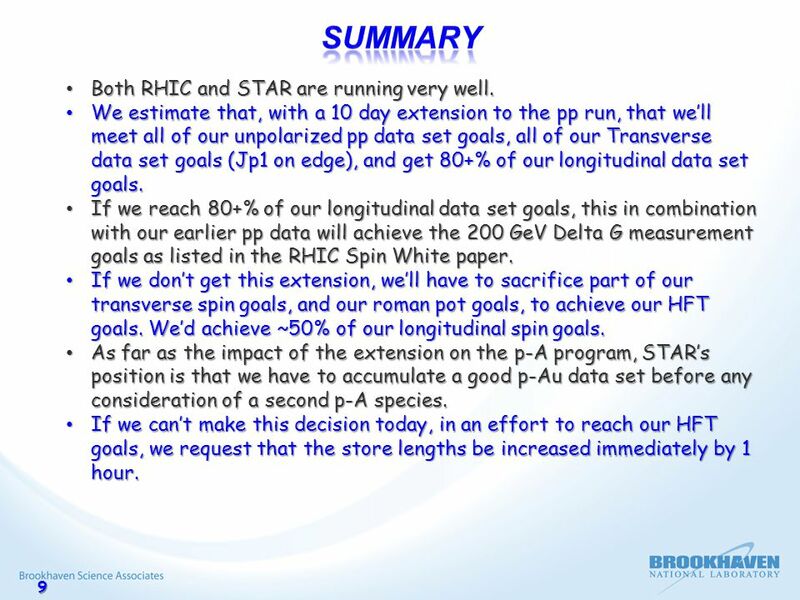 Christie, BNL RHIC/AGS Users Meeting June 4, STAR Goals and Performance, 2009 Run Outline Summary of STAR Goals for RHIC Run 9 Brief Summary. Longitudinal Spin at RHIC 29 th Winter Workshop on Nuclear Dynamics February 7, 2013 Cameron McKinney. Carl Gagliardi – DIS2008 – Jets in pp at RHIC 1 Jet Production in Polarized pp Collisions at RHIC Carl A. Gagliardi Texas A&M University for the Collaboration. 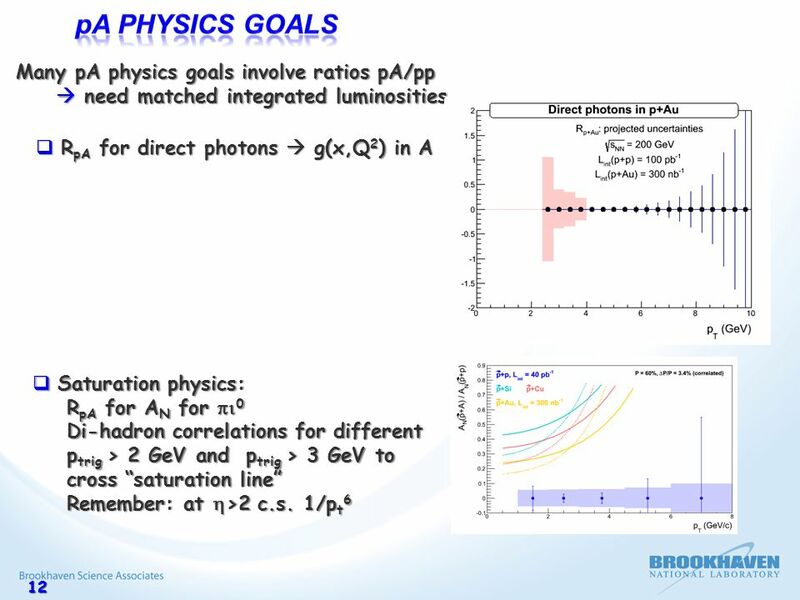 10/03/'06 SPIN2006, T. Horaguchi 1 Measurement of the direct photon production in polarized proton-proton collisions at  s= 200GeV with PHENIX CNS, University. J. Seele - WWND 1 The STAR Longitudinal Spin Program Joe Seele (MIT) for the Collaboration WWND 2009. Run 12 RHIC Machine/Experiments Meeting 24 Jan 2012 (5 th meeting) Agenda: G  for 100 GeV pp run 100 GeV pp Lumi Goals Power Update. Mar. 17, 2006 Imran Younus Probing Gluon Polarization with Longitudinally Polarized p+p Collisions at  s = 200 GeV. RUN 11 RHIC MACHINE/EXPERIMENTS MEETING 5 Apr 2011 Agenda: Open. Run 13 RHIC Machine/Experiments Meeting 21 May 2013 Agenda: Status Reports. Time Meeting PHENIX Run-15 Status Douglas Fields PHENIX Run-15 Run Coordinator University of New Mexico. 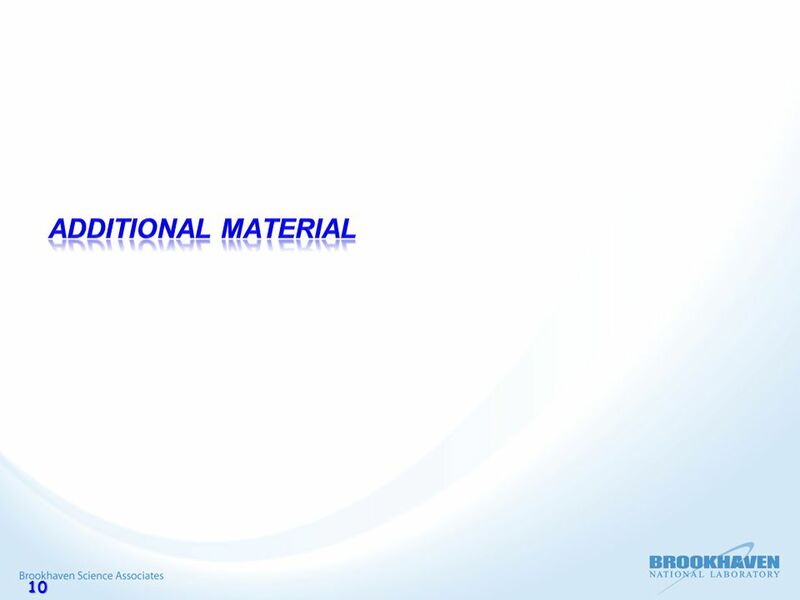 Summary of FMS/Jet Meetings July FMS Meeting: 7/21/14 Discussion of progress refurbishing the FMS – First delivery of ~40-50 finished bases from. A N DY Status Commissioning with colliding beams (p  +p  at  s=500 GeV) L.C.Bland, for AnDY 19 April 2011 Time Meeting, BNL.